England came back in the second half as a different team. Their entire approach to the game was changed as they took calculated risks against Spain. This resulted in them scoring four consecutive goals as they thrashed European neighbours Spain to win the junior World Cup. See you again, this is your host Sourav Neogi, logging out, good night! 10:20 Spanish footballers are given the runners' up medals. Indian Football Team captain Sunil Chhetri presents the English side with the World Cup trophy! 10:10 England's Philip Foden is awarded the Best Midfielder of the Tournament award. Rhian Brewster gets the Golden Boot award. 90'+4' And they have done it! England U-17 are the champions of the world! THIS IS THE COUNTRY'S SECOND WORLD CUP WIN IN A CALENDAR YEAR! 90'+1' Yellow card for Rhian Brewster who was apparently showing some aggressive behaviour towards the Spanish no.7! 90' Substitution for England! Angel Gomes is sent IN as Tashan Oakley-Boothe is taken OUT. Meanwhile, four minutes of extra time have been added to the second half of the game! 88' GOOOOAAAAL! Foden scores! It's a goal feast people! Of which, Phil Foden is the host nonetheless! 86' Substitution for ENGLAND! Connor Gallagher comes IN as George McEachran goes out of the fold. 83' GOOOAAAAAL! It's Marc Guehi! The defender scores the sixth goal of the match! 81' Substitution for England! Morgan Gibbs-White goes OUT as Nya Kirby comes IN. 80' Chance for Spain! Abel Ruiz dribbles through two English defenders before shooting the ball just out wide! Wasted! 76' The attendance for tonight's match have come in. The FIFA U-17 World Cup 2017 final is being attended by 66,684 people in the stadium! What a time to be alive for the Indian football fans! 75' Hudson-Odoi with a daring run up the right flank. Jaume tries to flank him but the Chelsea youngster goes on few more yards before finally being pushed by Gullamon who clears the threat immediately! 71' What a brilliant tactical change by Steve Cooper here! The man goes down two goals, changes his entire tactics which results in three back to back goals! Very few managers in the world capable of doing that even on their day! Meanwhile, two back to back misses by Spain! If this keeps continuing, the Spanish can kiss their title dreams goodbye! 69' GOOOOAAAL! Philip Foden with arguably the winner here in the VYBK Stadium! What a comeback story this has been by the English! England leads! 67' Spain with a corner. Gomez takes the shot. Victor Chust heads the ball wide outside the play. Wasted again! 63' Spain has apparently lost their upper hand over England. The English midfielders are tracking back unlike the previous half. The Spanish forwards are being tamed between the gaps of the English defenders! Brilliant comeback by the English! 59' Spain with a corner. Miranda heads the ball but Anderson saves the header rather easily. It's safe to say that the English have been finding their feet already in the second half. 57' GOOOOAAAAL! Morgan Gibbs-White scores the equalizer for the Three Lions! 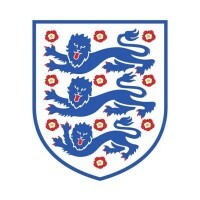 England 2-2 Spain! 52' The English have taken a much defensive approach in the second half so far. The Three Lions are concentrating to intercept the Spanish counter attacks in the middle of the park. 46' And the second half is underway here in VYBK Stadium in Kolkata. England is trailing against Spain! 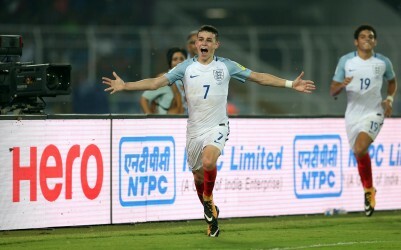 England started the match in a destructive mood, attacking multiple times and almost scoring in the first five minutes. However, the Spanish just sat back, defended well. Later, the Spanish started pressing the English back into their own half, which resulted in them putting two goals past England. The Three Lions came back at them in the dying minutes of the first half, as Rhian Brewster scored the first goal for side, providing a fighting chance in the second half to his side. Be back in a jiffy, stay tuned! 45'+2' Brewster misses! The Liverpool youngster shots the ball in the top right corner of the bars but Spanish custodian Alvaro Fernandez fists the ball out of the game! Meanwhile, the referee whistles to indicate the conclusion of the first half! Don't go anywhere, stay tuned for the first half highlights! 45'+1' Free kick for England! Just infront of the Spanish box! Brewster seems to be taking the shot! 43' GOOOAAL! Sessegnon finds Brewster lurking into the Spanish final third and sends him a cross. Brewster doesn't make a mistake and puts the ball past the goalkeeper almost instantly! 41' Foden with another daring run in the opposition final third but the youngster is intercepted by Valencia youth product Guillamon easily! 37' Looks like Brewster has changed positions with Phil Foden in the vanguard. The Liverpool star is currently operating on the right wing while the Manchester City youngster is waiting for the incoming passes from the back. Meanwhile, Miranda is injured the referee calls for the medical assistance in the field. 34' its just half an hour into the game and England is on their back heels already. Juan Miranda sends in a delightful cross intended for Torres but the winger heads it out wide. Wasted once again! 30' GOOOOAAL! A curler by Sergio Gomez finds its destination behind the English custodian! Spain leads by two goals to nil! 25' In spite of the heavy marking, Foden is the only silver lining presently in the English lineup. Is trying to get in the box every moment, but, can't produce the final product itself. 21' Foden with a free kick from the right side of Spain's final third. The ball gets deflected by Brewster. Mohammed Moukhliss picks up the ball and launches a daring run to the opposition final third. Curtis Anderson charges the midfielder, which results in him saving his side once more in the game. WASTED! 18' Surprisingly, the midfield superiority England has been showing since the beginning of their campaign is gone now! Spain is controlling the midfield but is lacking the forward passes. Sideways passes and lack of first touches are killing Spain's chances of sealing the game early. Meanwhile, Guehi brilliantly intercepts Abel Ruiz in the England box, saving his side from further demolition in the first half itself! 12' An unexpected attack saw the Spanish armada score the opening goal in the 10th minute. Since the goal, the English are looking desperate already, playing with 10 men in the opposition half! 10' GOOOAAAAL! Sergio Gomez scores! Cesar Gelabart with the assist! England trails 0-1! 6' Phil Foden is being guarded heavily by Spanish right-back Juan Miranda. The Manchester City starlet is trying to cut into the middle but Miranda is marking him brilliantly, making his runs ineffective for the time being! 3' England with waves and waves of attacks! It's just been three minutes and the young Lions have almost scored twice! Spain is barely holding their defensive lines against a mighty English attack! 1' And it has started! Gents and ladies, this is the FIFA U-17 World Cup 2017 Final! Stay tuned! 19:57 The national anthems are all done. The players have chosen their sides and are now creating a huddle, only to prepare themselves for the last time before the whistle goes off! 19:50 The FIFA Logo is out in the middle of the pitch and the players are now coming out of the tunnel, all prepared to start in the FIFA U-17 World Cup 2017 Final. Steve Cooper looks a bit tensed, while, his Spanish counterpart is looking calm and composed as ever! 19:45 Spain's biggest worry against England is their failing defence against high pressing teams. The European champions have conceded five goals in the tournament until now, all of which have come against high pressing sides. Although, the Spanish coach, Denia hinted that he and his staff are working to the best of their power to change that, a display of which will be visible not too long from now. 19:40 The players have all gone back to their respective dressing rooms and the pitch is currently being prepared for the game to begin. Don't go anywhere folks, stay tuned! 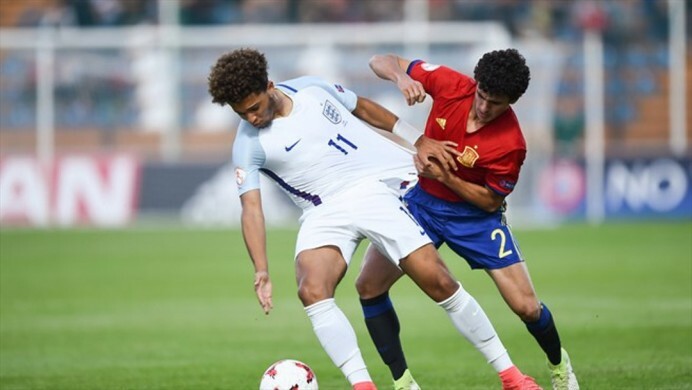 19:35 The English youth players last met the Spanish in the UEFA European U-17 Championship final in Croatia a few months ago, where they were defeated in a penalty shootout. However, the English head coach Steve Cooper believes the defeat is long gone from the mind of his players now and his boys are 'looking forward' to the game at hand. The Spanish head coach, Santiago Denia, hinted that he knows the tactics of his English counterpart all too well in the pre-match press conference on Friday. Also, the Spanish have often displayed a weakness against high pressing teams in the tournament, which leaves England as a very dangerous opponent for the La Rojas to face tonight! 19:30 The atmosphere at the VYBK Stadium is unreal right now! The stadium is almost full from the last game and still, there is an ocean of incoming crowd into the stadium! This is going to be a mindblowing experience for both the teams! Peeps, this is the Salt Lake Stadium and football has truly taken over in India! 19:25 England head coach Steven Cooper has made only one change in the squad that defeated Brazil in the semi-final of the tournament. Marc Guehi returns in the fold to partner skipper Joel Latibeaudiere in the heart of the defence. With Spain, who are one of the most goalscoring teams in the tournament, as their opponents, this is going to be a real test for the young English defenders. 19:20 The England team just came out of the tunnel and went into the pitch for their last moment warm up and preparation. Both the teams are now on the pitch, both are looking very confident but the question still remains, who will come out as the winners? England - Anderson (GK), McEachran, Guehi, Panzo, Foden, Oakley-Boothe, Brewster, Hudson-Odoi, Latibeaudiere (C), Sessegnon, Gibbs-White. Spain - Fernandez (GK), Jaume, Miranda, Guillamon, Chust, Blanco, Torres, Moukhliss, Ruiz (C), Gomez, Gelabert. 19:10 Here are some interesting facts about today's match. Spain have appeared at two previous FIFA U-17 World Cup Finals in 2003 and 2007. This is England's first. This is the first all-European final in the FIFA U-17 World Cup. England are on the cusp of winning two Junior World Cups in the same year after their U-20 team lifted the title at the U-20 World Cup in South Korea earlier this year. 19: 05 Now, this game is historic for several reasons. Why not read our big match preview to get in the mood before kickoff. 19:00 Hello and welcome to the Live commentary of the biggest football match on Indian soil. Its the Final of the FIFA U-17 World Cup, India's first FIFA event. The country has been building up to this tournament for the best part of four years and it has captured our imagination over the past three weeks. Now, it is set for an exciting finale in a truly iconoc setting. I am your host Sourav Dey Neogi here at the magnificent Salt Lake Stadium to bring you all the action Live.